ACORN, the Association of Community Organizations for Reform Now, is the largest community organization of low and moderate-income families in the United States. ACORN has an active membership of over 160,000 families, organized into more than 750 neighborhood chapters in more than 60 cities across the country. As a community group, ACORN is non-profit, non-violent, and nominally non-partisan. The organization was born out of the civil rights movement. ACORN was founded by Wade Rathke, a community and labor organizer, in 1970. The current national president of ACORN is Maude Hurd. ACORN groups win reform through direct actions, negotiations, working with the media, and, sometimes, by getting involved in electoral politics. The groups has headquarters in New York, New Orleans and Washington, D.C.
ACORN works to enact policy changes to benefit low and moderate income families and seeks changes that will lead to "stronger, safer and more just communities." According to its Web site, "ACORN helps those who have historically been locked out become powerful players in our democratic system." The organization has worked to increase the minimum wage and enact living wage policies; eliminate predatory financial practices by mortgage lenders, payday lenders, and tax preparation companies; win the development of affordable housing and community benefits agreements; improve the quality of and funding for urban public schools; rebuild New Orleans; and pass a federal and state ACORN Working Families Agenda, including paid sick leave for all full time workers. ACORN also works to register voters in the communities they seek to benefit, and since 2004 ACORN has helped more than 1.7 million low- and moderate-income and minority citizens apply to register to vote. ACORN offers free tax preparation that focuses on using the Earned Income Tax Credit. The offer screening for eligibility for federal and state benefit programs and, through the ACORN Housing Corporation, they offer first-time homeowner mortgage counseling, foreclosure prevention assistance and low income housing development. During the 2008 Presidential election conservatives attacked ACORN for "vote fraud" (before any votes had been cast) along with accusations that ACORN had caused the financial crisis by "forcing banks" to lend to "minorities." A widely-repeated example of these claims is a September 29, 2008 opinion piece by Stanley Kurtz, a writer for the New York Post. Kurtz wrote, "In other words, community organizers help to undermine the U.S. economy by pushing the banking system into a sinkhole of bad loans. And Obama has spent years training and funding the organizers who do it." The McCain/Palin Presidential campaign joined in attacks against ACORN. The McCain Campaign's blog describes a McCain ad attacking ACORN, saying "The ad highlights Barack Obama's involvement with ACORN, a group now accused of widespread voter fraud across the country and accused of advocating for the very type of home loans that have led to today's financial crisis." In the final presidential debate prior to the 2008 general election, John McCain accused ACORN of being “on the verge of maybe perpetrating one of the greatest frauds in voter history in this country, maybe destroying the fabric of democracy." McCain supported his unfounded allegations by pointing to ACORN’s work around home loans as a factor in the home foreclosure crises. ACORN has worked to eliminate the practice of "redlining," where financial institutions refuse to loan to individuals because they live in an area deemed to be a poor financial risk. See the related SourceWatch article, 2008 ACORN controversies. In addition, in the wake of the clandestine videotaping affair, ACORN performed an internal audit and ultimately accused O'Keefe of doctoring some of his videos, including removing comments that indicated ACORN staff did not take seriously the claims of a prostitution business. In January, 2010, James O'Keefe, the young conservative filmmaker who made the damaging videotape against ACORN was charged with criminal offenses against the U.S. government in an alleged plot to bug the New Orleans office of Democratic Louisiana Senator Mary Landrieu. Federal investigators charged that James O'Keefe was among four men who created a ruse to enter the lawmaker's downtown office, saying they needed to repair her telephones. O'Keefe used his cellphone to take pictures of two men involved in the Jan. 25 plot, according to court records unsealed Tuesday. Those men, Joseph Basel and Robert Flanagan, are accused in an FBI agent's sworn affidavit of impersonating telephone company workers, while O'Keefe and another man, Stan Dai, are accused of aiding the plot. After O'Keefe was was arraigned on federal charges in the telephone scandal, conservatives distanced themselves from him. The Salt Lake City Republican Party canceled his appearance as a keynote speaker at their February 4, 2010 fundraiser. Conservative pundit Michelle Malkin wrote that exposing wrongdoing is not an excuse to break the law, and that O'Keefe's alleged actions should be taken seriously. Conservative radio talk show host Rick Moran told his listeners that it looked as though O'Keefe had ignored the requirement that journalists be objective. An early effort against ACORN involved the appearance of a Website called RottenAcorn.com, created by the Employment Policies Institute (EPI,) a front group created by Washington, D.C.‐based astroturf specialist Richard Berman and his lobbying company Berman & Company. The rottenacorn.com Web site says ACORN is "really a multi-million-dollar, multi-national conglomerate," and "Its political agenda is driven by a relative handful of political thugs for hire." The Website accuses ACORN of contributing to the housing meltdown of 2008-2009 by pressuring banks to make sub-prime loans to borrowers. The site also accuses ACORN of "voter fraud" in its effort to register low and middle income people, and minorities. The site does not disclose who its funders are. Rick Berman has earned the nicknames "Dr. Evil," the "Conservatives' Weapon of Mass Destruction"and the "Astroturf Kingpin" for his repeated use of the strategy of forming non-profit front groups that advocate for the interests big business while shielding those same businesses from disclosing financial support for these efforts. 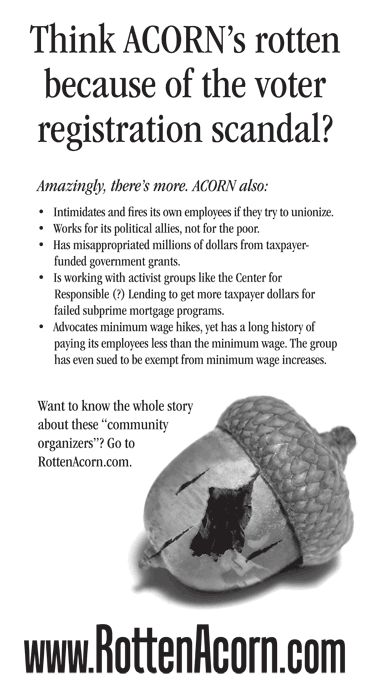 In the fall of 2008, prior to the general election, a full-page, anti-ACORN ad appeared in the New York Times that accused acorn of a list of abuses that made the group appear hypocritical: intimidating and firing its own employees when they tried to unionize, misappropriating millions of dollars from taxpayer-funded government grants and advocating minimum wage hikes while paying its own employees less than minimum wage. The ad did not indicate what person or organization had funded it.In an October 29, 2008 article, the investigative journalism group ProPublica revealed that both the ad and the "RottenACORN.com" Website are funded by Rick Berman's Employment Policies Institute, which has among its clients, the American Beverage Institute, a trade group for bars and restaurants. ACORN has fought predatory lending by targeting the national companies that practice it, working for stronger state laws against predatory practices, organizing against local financial scams, and steering individuals toward loan counseling. Following a three-year campaign to reform the lending practices of Household Finance, one of the largest subprime lenders in the country, on November 25, 2003, ACORN and Household (now owned by HSBC Holdings) announced a proposed settlement of a national class-action lawsuit that ACORN brought against the company in 2002. The centerpiece of the settlement is a $72 million Foreclosure Avoidance Program which will provide relief to Household borrowers who are behind on their payments and at risk of losing their homes. This settlement came on the heels of an earlier $484 million settlement between Household, attorney generals, and bank regulators from all 50 US states. In early 2003, ACORN began efforts to seek similar reforms from Wells Fargo. At ACORN's national convention in 2004, three thousand ACORN members presented Wells Fargo with a lawsuit. Living Wage ordinances require private businesses that benefit from taxpayer money to pay their workers a wage that allows them to afford basic necessities. ACORN is a leader in the national living wage movement and has passed local living wage laws in 15 cities including Chicago, Oakland, Denver, and New York City. ACORN maintains the Living Wage Resource Center, which provides strategy and logistical assistance to organization nationwide. ACORN pushes education reform usually in the form of organizing neighborhood groups and "community" or "ACORN schools" but frequently combats charter school and for-profit schooling initiatives (most notably the proposed Edison Schools takeover of the New York City public schools in 2001). By organizing tenant unions, pushing for inclusionary zoning, and ensuring fair and increased access to low-interest home loans, ACORN has sought to extend the possibility of homeownership to all people. In the 1980s, ACORN members fought banks to that were refusing to give home loans to people living in low income and minority neighborhoods. The practice is called redlining, and is now illegal as a result of campaigns by ACORN and other organizations. Additionally, ACORN created a loan counseling program called ACORN Housing. ACORN Housing is distinct organization from ACORN, though the two work closely together to increase home ownership. Along with establishing laws requiring and laws promoting childhood lead poisoning prevention, ACORN has won clean-up of work sites and housing units contaminated by lead, asbestos, and mold. Around the country, thousands of ACORN members participate in ACORN National Clean Up Day, clearing abandoned lots, restoring neighborhood parks, and turning illegal dumping areas into community space. Once these sites are cleaned and reclaimed, the local government or owner of the site commits to ensuring that the area is properly maintained. Additonally, ACORN has won emissions monitoring from factories near neighborhoods and schools, and closures of industrial plants that caused public health problems. ACORN has fought for the rights of undocumented immigrants. ACORN has promoted amnesty for such workers, most notably at a rally in Chicago in 2000 and as a major sponsor of the Immigrant Workers Freedom Ride Coalition. ACORN has engaged in massive voter registration projects in several states, most notably Florida, where the minority vote has been under-represented. In 2004, ACORN has registered over 1 million voters nationally. ACORN was founded by Wade Rathke when he was sent to Little Rock, Arkansas by the National Welfare Rights Organization (NWRO) in 1970 as an organizer. Rathke's first campaign was aimed at helping welfare recipients attain their basic needs, such as clothing and furniture. This drive, inspired by a clause in the Arkansas welfare laws, began the effort to create and sustain a movement that would grow to become the Arkansas Community Organizations for Reform Now - the original ACORN. ACORN's goal was to unite welfare recipients with needy working people around issues of free school lunches, unemployment issues, Vietnam veterans' rights, and emergency room care. The broad range of issues did not stop there as the organization grew throughout Arkansas. ACORN organized farmers to take on environmental issues concerning sulfur emmissions. Meanwhile, in 1972 back in Little Rock, ACORN was holding neighborhood rallies on a variety of issues, endorsing candidates for local office and eventually had members running for office themselves in 1974. In 1975, ACORN became a multi-state organization with new branches in Texas and South Dakota. On December 13, sixty leaders from the three ACORN states elected the first associate Executive Board and the first ACORN president, Steve McDonald, to deal with matters beyond the scope of the individual city and state boards. Each year thereafter saw three or more states join ACORN with a total of twenty states in 1980. The great expansion of the organization led to multi-state campaigns beginning with a mass meeting of 1,000 members in Memphis in 1978. At the end of the conference, ACORN convention delegates marched on the Democratic Party conference with the outline of a nine-point "People's Platform" which would go on to become the foundation of the organization's platform when it was ratified in 1979. ACORN was heavily involved in the 1980 Election with the "People's Platform" serving as its standard bearer. Demonstrations aimed at both major party candidates including demands to meet with President Jimmy Carter, marching on the president's campaign finance committee chair's home, and presenting the platform to the GOP platform committee. ACORN'S staff was stretched thin by the demands of meeting the goal of expanding to twenty states by 1980. Much of its resources and energy had been dedicated to participating in the presidential primaries and national conventions of the Republican and Democratic Parties. ACORN launched a campaign to obtain affordable housing which resulted in squatting campaigns. ACORN took the concept a step further though by encouraging people to move into a vacant, usually poorly kept house and to refit it for comfortable living. It also involved the risk of arrest for breaking and entering and trespassing. In June of 1982 ACORN sponsored "Reagan Ranches" in over 35 cities believing the president's focus to be on military as opposed to social spending. "Reagan Ranches" were tent cities erected nationally for two days and met with serious resistance from the National Parks Service who tried repeatedly to evict ACORN tenters. The protesters remained and then marched on the White House and testified before a Congressional committee about what they described as the housing crisis in America. The Republican Convention in Dallas, Texas in 1984 was the culminating "Reagan Ranch". In addition to protesting ACORN also developed and strengthened its political action committees and encouraged its members to run for office. For the 1984 Election ACORN wanted to endorse a candidate, setting a 75% support in polls among members as its requirement. No candidate reached that level, though there was strong support for Jesse Jackson. A legislative office was also established in Washington, DC. During this period ACORN also focused on local election reform in a number of cities, including Pittsburgh, Pennsylvania, Columbia, South Carolina, and Sioux Falls, South Dakota encouraging the change of at-large legislative bodies to district representation. ACORN grew to twenty-seven states, adding chapters in New York City, Washington, DC, and Chicago, Illinois by the end of Reagan's first term. During the 1988 Election ACORN held its National Convention in the same city as the Democratic Convention -- Atlanta, Georgia. During the preceding four years ACORN had strengthened its ties with Jessie Jackson and accounted for thirty Jackson delegates. They also sponsored a march at the convention. ACORN's membership grew to 70,000 plus in twenty-eight states during this time. The organization increased its legislative lobbying efforts in Washington and strengthened its PACs. It also developed what it called the Affiliated Media Foundation Movement (AM/FM). Starting with station KNON in Dallas, AM/FM moved on to establish radio stations, UHF television and cable television programming. It also sought and received appointments to the Resolution Trust Corporation (RTC) which was formed to dissolve the assets of failed Savings and Loans resulting from the Savings and Loan crisis. While some of ACORN's most notable efforts were in the area of housing, it has counted health, public safety, education, representation, work and workers' rights and communications concerns among its victories. The 1990 ACORN convention in Chicago focused on the fast-breaking housing campaign. It featured a squatting demonstration at an RTC house which was reclaimed for use in an ACORN neighborhood. Later, ACORN members demanded cooperation from banks about providing loan data on low- and moderate-income communities and compliance with 1977's Community Reinvestment Act (CRA). ACORN fought weakening of the CRA in 1991, when ACORN staged a two-day takeover of the House Banking Committee hearing room to be sure their voices were heard by Congress. It also established ACORN Housing Corporation to service people moving into homes under the housing campaign, rehabilitated hundreds of houses addressed by CRA. The ACORN convention in New York in 1992, the "ACORN-Bank Summit," was organized to hammer out deals with giant banks. When Citibank, the nation's largest bank, did not participate conventioneers protested at Citibank's downtown Manhattan headquarters, and won a meeting to negotiate for similar programs. ACORN supported and lobbied for the "Motor Voter" Act. After its passage, ACORN members attended President Clinton's signing ceremony. ACORN then pursued new registration laws in Arkansas and Massachusetts and filed suit in Illinois, Louisiana, Michigan, Missouri, New Jersey and Pennsylvania as a result of the act. In 1993, ACORN also began a national campaign to fight insurance redlining, a practice that put the gains made in other housing campaigns at risk. The campaign targeted Allstate, hitting sales offices in fourteen cities and a stockholders meeting. Allstate agreed to negotiate and signed an agreement in 1994 for a $10 million partnership with ACORN and NationsBank for below-market mortgages to low-income homebuyers. Travelers Insurance came on board with a Neighborhood and Home Safety Program, linking access to insurance and lower rates to public safety programs. ACORN's recent activities have included its "Living Wage" programs, voter registration, and grassroots political organization. In 1998 ACORN helped form the Working Families Party in New York which counts increasing the minimum wage as its centerpiece issue. ACORN has also strengthened its ties with the Service Employees International Union often working collaboratively on issues (including health insurance costs and the minimum wage) and even sharing office space. The organization continues its multi-issue focus however, pursuing a wide range of issues while building grassroots strength and progressive capacity. In 2003, ACORN opened operations in 20 new cities, including 5 state capitals. 2004 saw ACORN become an international organization, opening offices in Canada, Peru, and beginning work in Dominican Republic. Despite its support and activism for progressive causes, ACORN has been a harsh and staunch opponent against the unionizing of its own workers. Most notably, in 2001-2003, ACORN fought with the Industrial Workers of the World, which tried to organize its workers in various districts. The threat of unionization led to a number of firings, strikes, and protests. Ironically, ACORN operates two multi-state Service Employee Industrial Union locals. ACORN is funded in part by individuals who are members of the Democracy Alliance. ↑ McCain campaign website blog post, New Web Ad: "Acorn", October 10, 2008. Stephanie Strom, "Acorn Report Raises Issues of Legality," New York Times, October 21, 2008. This page was last edited on 27 January 2010, at 23:47.